Angst. Emotion. Edge. Boldness. Heart. Vulnerability. 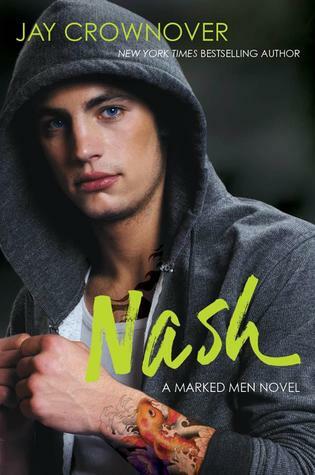 Nash’s story had it all and I loved every moment! The Marked Men novels are my new favorite series! A must read. Oh my sweet, tatted rough-and-tumble Nash with a big huge heart. I loved him before, but to see him feel so much for those he cared about, to see him shoulder the burdens of so many, to see him determined to be there for others despite being lost in the oblivion of his own turmoil… well, it got me. I fell hard for the boy with the purple eyes. His story is one of oppositions. About deceptive perceptions and lingering pain. A story of first love and scarring heartbreak. I loved the vulnerability in the story. The emotions felt real. And of course, what makes this series even more special is the solidarity of this group of misfits, who despite blazing their own paths, always have each other’s backs. Nash is a juxtaposition of hardness and heart. His tough exterior, inked with bright flames of individuality are a deceptive guise for the hurt and abandonment he’s felt for so long. He’s always been there for his band of brothers, for his best friend, Rule, for Cora too, but the feelings of hurt inside of him have been bearable due to one man… his Uncle Phil. Now Phil lies in a hospital bed weakened by cancer, time ticking away as truths that were buried for so long are revealed, shattering Nash’s already fragile reality. And just as everything comes crashing all around him, a face from the past is there to soothe with stolen touches and calming words he never expected. We met Saint Ford before. She’s a nurse that is very good at her job, ready to be a soothing balm to those that need her. She never expected that face from her past to come tumbling into her life again. A face that personified so much of her pain and insecurities, that symbolized rejection and heartbreak. Seeing him begin to fall apart however, was too much for her to ignore. Nash has always unsettled her and now, seeing him older, bolder… well, it’s doing things to her that it shouldn’t be doing. And truth be told, she hadn’t been able to find closeness with any other man because she would be lying if she said Nash wasn’t a permanent fixture in her thoughts throughout the years. Saint too, is a study in opposition. She seems so perfectly put together. Successful. Determined. Inside, however, she’s riddled with insecurities about herself. Saint felt like a very real character to me. Who hasn’t felt the weight of old heartbreak and insecurities years later? She’s been paralyzed by a lingering fear of feeling that heartache all over again. Saint is so stuck in the past, she doesn’t see who she is now, nor does she believe others have changed, particularly Nash. So begins an agonizing push and pull between them. Saint makes it clear to Nash that she doesn’t like him, but there are times she can’t help but respond to his kindness and vulnerability. Despite the fact that Nash didn’t do long-term relationships… didn’t see that for himself, there’s just something special about Saint that pierces right through to the heart of him. When she isn’t pushing him away, she’s kind and caring, filling a gap inside that was left wide open when his family practically abandoned him. And before too long, he finds himself falling for her. Wanting her. Needing her. Saint finally makes it clear she wants him too, but the past continues to haunt their present and her insecurities really begin to drive a wedge between them. Nash begins to crumble from all the weight he carries on his shoulders. With Phil dying and holding onto truths he needs to hear, and a new business pressuring him into action, all on top of Saint’s frustrating trust issues, he begins to spiral out of control. Saint won’t let herself fall for fear of her heart breaking permanently, but she needs to react because Nash needs her and she runs the risk of losing him forever when all he’s shown her is love. This book is another amazing addition to this awesome series brought to life by a motley crew of bold individuals. The level of angst was alluringly high in this one and it was interesting to see that it was the girl, in this case, that had to work harder at fixing her issues to make the relationship work. There were also some moments that completely gutted me and made me tear up. Overall I just felt it was a solid, addictive, wonderfully paced book about really seeing the person you love and being smart enough to grab a hold of that goodness before we lose it all to the stuff that doesn’t really matter in the end. I can’t wait to keep reading and up next is Rowdy St. James and Salem Cruz!! !